The news that a Breaking Bad movie is in the works coming on the heels of the announcement that Andrew Lincoln has signed on to star in three Rick Grimes movies is another sign that AMC can't let go of its biggest hits. "It seems as though AMC wants to create giant spinoffs of their most famous projects, and I am not buying it so far," says Kate Gardner. 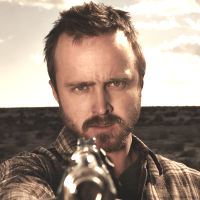 "We need a Breaking Bad movie about as much as we need a Rick Grimes trilogy. While I don’t mind franchises and shared universes, not everything has to be a shared universe in the end. Sometimes, contained stories are just fine on their own. Otherwise, you’re more likely to end up with a Dark Universe than you are a Marvel Cinematic Universe." You can't improve perfection: "To rejoin the action would be tantamount to whipping out a paint roller and touching up a Caravaggio"